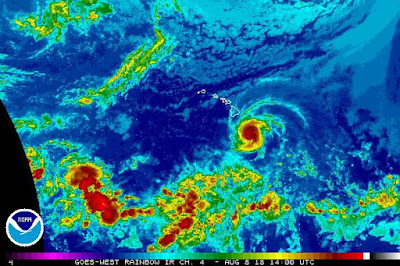 Hurricane Hector, a major storm in the Central Pacific, has maintained its strength as it continues churning closer to the islands. At 5 a.m. Wednesday, the storm was packing maximum sustained winds of 125 miles per hour, with occasional higher gusts. Hawaii News Now. Packing maximum sustained winds of 125 mph this morning, the still-powerful Category 3 Hurricane Hector is well south of the islands and expected to stay on a westward track away from Hawaii. Star-Advertiser. Northern fringes of Hector expected to ‘brush the Big Island’. A state of emergency was declared late Tuesday by Hawaii County Managing Director Wil Okabe due to the threat of Hurricane Hector. Tribune-Herald. Fringes of Hector to Brush Big Island, 73 mph Winds. Maui Now. Hector may have weakened to a Category Three hurricane, but with maximum sustained near 125 mph, it is still a powerful storm. Big Island Video News. Congresswoman Tulsi Gabbard Avoids Public Debate/Forum in Primary Election Race. Hawaii’s Congresswoman Tulsi Gabbard has made it through two election cycles without facing any of her challengers in a public debate or forum. Hawaii Public Radio. Four days before the primary election, some candidates are pushing back against a slew of ads paid for by Super PACs. Hawaii News Now. Super PAC donations draw criticism. Kauai Mayor Bernard Carvalho raised concerns about the influx of super PAC money in the race to be Hawaii’s next lieutenant governor during remarks in the rotunda of the state Capitol on Tuesday. Star-Advertiser. It may be a few days before Hawaii’s primary election, but for Mayor Bernard Carvalho Jr., that doesn’t mean he’s slowing his campaign for the lieutenant governor’s seat. Garden Island. How Martin Hamburger Became A Staple Of Hawaii Politics. A Washington advertising consultant made headway in the islands by helping big-name clients who were willing to poke fun at themselves. Civil Beat. RIMPAC glitches adjusted on the fly. There’s an old military adage that no battle plan survives first contact with the enemy — and the need to adapt on the fly applies to military exercises such as Rim of the Pacific as well. Star-Advertiser. After several disasters, Hawaii Foodbank sees its stockpile dwindle. Every day, the Hawaii Foodbank distributes up to 50,000 pounds of food to member agencies who get it to the hungry. Hawaii News Now. Hawaii Foodbank in 'urgent need' of supplies following recent natural disasters. The Hawaii Foodbank said it is in “urgent need” of emergency food and monetary donations, following a decrease in summer donations. Pacific Business News. Lawsuit over Kakaako condo tower ‘defects’ dismissed. A federal judge in Honolulu has dismissed a lawsuit in which a developer sought more than $75 million in damages from a contractor for alleged construction defects in the ultraluxury Waiea condominium tower in Kakaako. Star-Advertiser. Settlement talks set to begin in civil rights suit over huge gambling case that failed twice. City attorneys are heading to the bargaining table to try and settle a civil lawsuit over a gambling case that failed twice in court and resulted in state judges scolding deputy prosecutors. Hawaii News Now. Forensic lab in Hawaii begins long process to identify Korean War remains. Inside a government forensic lab on Oahu are the remains of what are believed to be American soldiers killed in the Korean war. KITV. The U.S. Army has agreed to restore access to a valley considered sacred on Oahu in a settlement with a Native Hawaiian cultural group. Associated Press. As thousands of students return to school this month, the Hawaii Department of Transportation announced it will suspend one week of morning road closures as part of its “Beat the School Jam” initiative. Star-Advertiser. After more than 40 years of creating some of Hawaii's favorite desserts, today is the last day for Saint-Germain and Dee Lite Bakery. KHON2. Solar permits issued on Oahu fell in July for the second month in a row but are still ahead of the year-earlier period. Star-Advertiser. Mayor Harry Kim plans to ask the state Legislature for $550 million for disaster recovery following three months of destructive lava flows and earthquakes in the wake of the May 3 eruption of Kilauea volcano. West Hawaii Today. County spending for lava response tops $5 million. Hawaii County has spent $5.1 million responding to the Kilauea eruption in the past three months. Tribune-Herald. The County of Hawaii Clerk's Office will close absentee walk-in voting sites at the Pahoa Community Center and the Pahala Community Center on Wednesday, August 8, due to the threat posed by Hurricane Hector. KHON2. Respected cultural practitioners spoke during Tuesday council committee meeting in support of an appropriate process to name the volcanic Fissure 8 on Kilauea Volcano's lower East Rift Zone. Big Island Video News. News of a slowdown in the 3-month-old Kilauea volcanic eruption has brought a glimmer of relief to the Big Island’s tourism industry. Star-Advertiser. Lava flow’s impacts hit Kona and Kohala Coast. While Hawaii island tourism is still up year over year, it experienced a 5 percent drop in visitor arrivals in June. Hotel occupancy also dropped in June by its largest amount in almost five years. Star-Advertiser. A district on Hawaii’s Big Island is among the top 10 markets where homebuyers look to buy vacation rental properties, according to a report from Vacasa. North Kona, which includes Kailua-Kona, was ranked No. 9 on Vacasa’s list of the top 25 markets for buying a vacation rental. Pacific Business News. Array of tests zero in on disease afflicting wild horses in Waipio Valley. Around a dozen wild horses in Waipio Valley have died inexplicably and in similar fashion over the last two months. West Hawaii Today. Maui re-launching Junk Vehicles Disposal Assistance Program. Under this program, residents will be able to dispose of one vehicle per year at no charge. KHON2. Along with seat belt, cellphone and speeding violations, police are watching for adults smoking in vehicles occupied by children, as students go back to school this week. Maui News. Maui’s largest private landowner, Alexander & Baldwin, is selling 313 acres adjacent to Kahului Airport to the state for $8.6 million and the Lahaina Square Shopping Center and adjacent parcels to an unnamed buyer for $11.3 million, the company said in announcing its second-quarter results last week. Maui News. Kealii Reichel hopes to break ground on his halau’s permanent home in Piiholo next year, the kumu hula said Monday. Maui News. Kumu hula plans construction of permanent halau home on Maui next year. Associated Press. Holy Mackerel, With No Tourists In Sight The Fish Are Returning To Kauai’s North Shore. Local fishermen say the impact of the April storm on tourism has been a boon to the fish population. Civil Beat. Ishihara opens under new ownership. The common concern among shoppers was the poke, and bento lunches, Tuesday when Ishihara Market reopened under the ownership of the Kalama Beach Corporation. Garden Island. The median price of a single-family home on Kauai rose 11 percent last month, compared to a year ago, while the median price of a condominium in July jumped by more than 30 percent, according to statistics from Hawaii Information Service on behalf of the Kauai Board of Realtors. Pacific Business News.